Co-author of a review article published in Particle and Fibre Toxicology, Dr. Monita Sharma, talks here about a project funded by PETA International Science Consortium Ltd. to devise a non-animal approach to assess pulmonary effects of nanomaterials. Exposing cells to aerosolized substances at the ALI requires integration of an aerosol generator with an exposure chamber to simulate realistic exposure scenarios. The increasing use of multi-walled carbon nanotubes (MWCNTs) in consumer goods such as paints, building materials, and electronics has greatly increased the likelihood of human exposure. Inhalation is one of the most prevalent routes by which exposure can occur, and because inhalation of MWCNTs may be linked to lung problems such as pulmonary fibrosis, hazard testing is conducted to assess the safety of these materials. In many jurisdictions, the current regulatory requirement for substances of concern, such as MWCNTs, is a 90-day rodent inhalation test, but there are financial, ethical, and scientific concerns associated with testing on animals. For this reason, the PETA International Science Consortium Ltd. initiated a project to devise a non-animal approach to assessing pulmonary effects of nanomaterials. The review by William Polk and coauthors recently published in Particle and Fibre Toxicology is a part of this initiative. The first phase of the project involved the organization of an international workshop held at the headquarters of the Environmental Protection Agency in Washington, D.C.
At the workshop, experts in the field of inhalation toxicology discussed the state-of-the-science of inhalation toxicity testing and the design of an in vitro system predictive of the fibrotic potential of aerosolized MWCNTs. 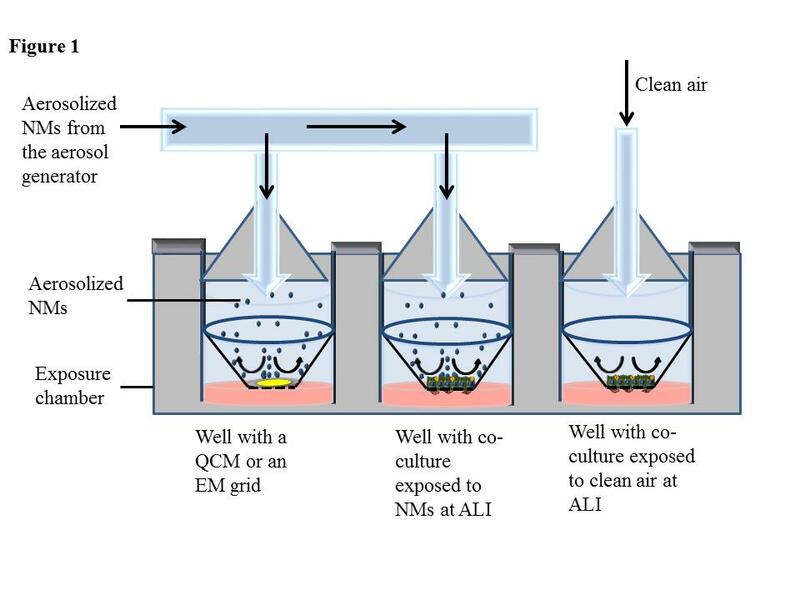 The experts stressed that human-relevant dosimetry and lifecycle transformations of nanomaterials should be considered when exposing lung-relevant cells co-cultured at the air-liquid interface (ALI) to these materials. The workshop proceedings, including recommendations on aerosol generation and exposure systems, characterization parameters, dose and dosimetry considerations, and relevant cell models and biomarkers, were published in three separate reports in peer-reviewed journals (here; here and here). The publications from the workshop assess the state-of-the-science and provide specific details on what should be included in an in vitro system to assess the pulmonary toxicity of nanomaterials. For instance, while Sharma et al. describe the relevant cell types and biomarkers, Polk et al. commingle the interdisciplinary concepts on the engineering side of the aerosol science with the complex biological aspects of the lung physiology, making it easier for researchers to choose the appropriate system based on their own needs. In the second ongoing phase of the project, the PETA International Science Consortium is funding three research groups to develop the aforementioned in vitro system. Dr. Barbara Rothen-Rutishauser of the Adolphe Merkle Institute at the University of Fribourg in Switzerland and Dr. Vicki Stone of the School of Life Sciences at Heriot-Watt University in Edinburgh, U.K., are jointly developing the system. The consortium is also funding the design of a human lung-tissue model by MatTek Corporation that will complement the work being done by Drs. Rothen-Rutishauser and Stone. In the third phase of the project, the system developed in the second phase will be tested in additional laboratories and using different nanomaterials. In the longer term, the system is intended to make up one part of a non-animal test battery, including in silico and in vitro assays that can be used in an integrated testing strategy. It will provide comprehensive information on biological endpoints relevant to inhalation exposure to nanomaterials, which could be used in the hazard ranking of substances during the risk assessment process. The PETA International Science Consortium Ltd. works to accelerate the development, validation, and global implementation of robust, human-relevant animal-free test methods. It was established in 2012 to coordinate the scientific and regulatory expertise of its international members. For more information, please visit PISCLtd.org.uk and www.PISCLtd.org.uk/nanoworkshop, or follow us on twitter @PISCLtd. Dr. Monita Sharma is the nanotoxicology specialist for the PETA International Science Consortium Ltd. In this capacity, she researches and promotes human-relevant non-animal methods to assess nanomaterials, and she participates in standards organizations to ensure that the best non-animal methods are included in international standards and guidelines.